Bring your vehicle down to the Auto Service Center in Bldg. 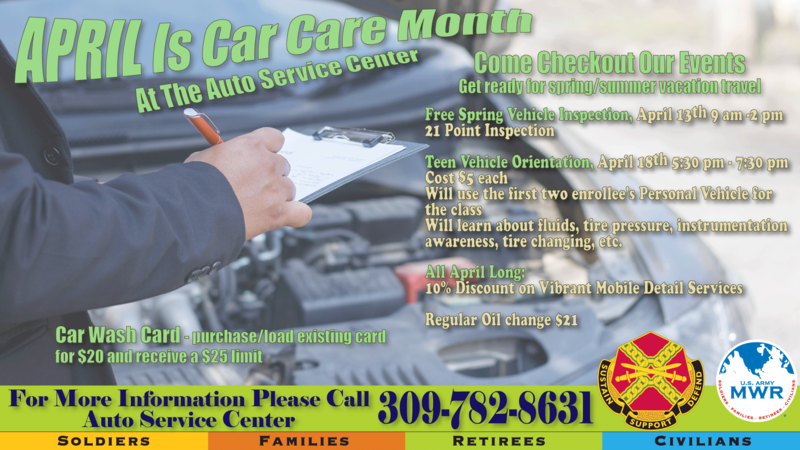 351 for our annual Spring Car Care Free Vehicle Inspection on April 13th and get ready for those summer road trips. This 21 point inspection will cover belts, hoses, tires, undercarriage, fluid levels and more to make sure your vehicle is safe for all those summer miles. Also enjoy $21 standard oil changes and 10 percent off Vibrant Mobile Detailing services during the entire month of April. Lastly, once your ride is tuned up and detailed make sure to grab a $20 preloaded car wash card and we'll load an extra $5 on there for free to keep your wheels shiny looking all month long. For more info please call the Auto Service Center at 309-782-8631.